Lumi Rolley of No Land Grab has already pointed out the revisionism promulgated in several officials' statements yesterday regarding the belated opening of the new $108 million pavilion for Long Island Rail Road commuters at the northwest end of Forest City Ratner's Atlantic Terminal mall, at Flatbush Avenue and Hanson Place. The worst example came from the AP, which asserted that "[t]he pavilion would better accommodate a surge in riders for the arena." 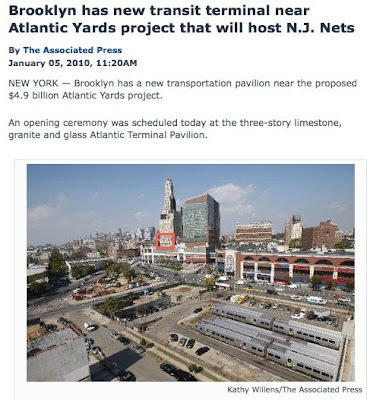 Given that project began in 2002, there's no connection to Atlantic Yards, which was announced in 2003, as City Council Member Letitia James pointed out in another article. Actually, it's in the complete opposite direction of the arena site, which is why Forest City Ratner is supposed to build an entirely new transit entrance well to the southeast, across broad Atlantic Avenue. The FEIS should examine the creation of a thru-ticketing arrangement for LIRR riders which enables them to pass through the paid zone for the subway to reach the Urban Room without payment of a subway fare. 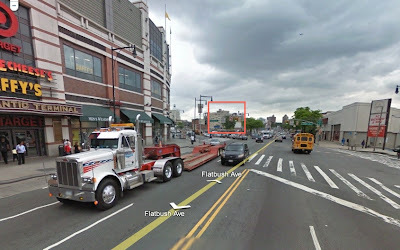 Otherwise, project generated trips via the LIRR would be required to use the existing entrance to LIRR’s street level concourse on Flatbush Avenue. The Empire State Development Corporation responded that that wasn't feasible. Below is a screen grab of the AP story, which shows part of the arena site. The location of the terminal entrance is marked in red, sandwiched between the Williamsburgh Savings Bank building and the Atlantic Terminal tower. It's a long way off, though the perspective of the photo leaves that unclear. 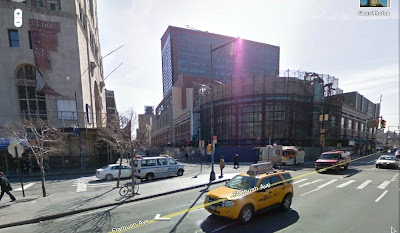 Below is a Google Maps screen grab of the entrance pavilion, under construction at Flatbush and Hanson, across the street from the bank tower. The main mall entrance is in the background. Below is a perspective looking south along Flatbush Avenue from the mall. The main mall entrance is in the foreground, and Atlantic Avenue separates the mall from the arena site, marked in red. 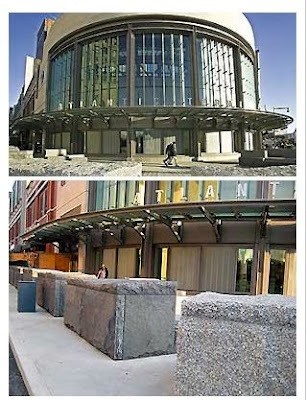 Moreover, as NLG has pointed out more than once, the security bollards around the perimeter of the LIRR entrance stand in stark contrast to official plans for the Atlantic Yards arena.